Amanda Lewan’s short story Christmas By Design was published in Niche’s fourth issue. It can be read here. Amanda Lewan is a Detroit based writer and storyteller. Her work has been featured in The Offbeat, About Place Journal, Wayne State Literary Review, and The Nation. Follow her online at http://www.amandalewan.com (http://www.amandalewan.com/). NICHE: Let’s start with the basics: When and why did you start writing? AMANDA LEWAN: I started writing a bit in high school, a little bit of poetry. Then when I got to college I took it more seriously. I had always known I wanted to pursue a career in writing. When I was twelve years old an English teacher read a poem I wrote about my parent’s divorce, and it moved me. I knew it was my calling. I had some great teachers at college that pushed me and supported me to keep writing. In graduate school I choose to really push myself and write a fiction thesis. I’ve loved writing fiction since, and still write some poetry too. NICHE: Who are some of the authors who inspire you? How have they influenced your writing and do you see some of their techniques seeping into your own work? AMANDA LEWAN: I really like poetic writers with a sharp edge to them: Don Delillo, Grace Paley, Cheryl Strayed, and Jennifer Egan. I also like postmodern writers, those who mix up genres and forms. I have a poetic style and strive to polish those sentences and images that drive my stories. I don’t necessarily feel that their work seeps into mine, but it encourages me to keep pushing my style and polishing it as my own. NICHE: Christmas By Design is a perfect title for your story. Can you explain to our readers why? the visual arts plays a role throughout the story. The title seemed to help draw those two aspects of the narrative together. NICHE: Christmas By Design is very much an epiphany story, in the Joycean sense of the word, can you explain what elements during the writing process led you to this story’s particular ending? AMANDA LEWAN: The idea for this story really came to me on a whim. I had just finished my Master’s thesis and the holidays were fast approaching. I didn’t have much money to spend and wanted to give back to my family. So, I thought I’d write a story dedicated to them (though not inspired by them at all). I knew I wanted to write a holiday story with the theme of family, but had no idea what would come out. The main character and images she drew pulled me in immediately, and I liked the idea of a broken family, a sad character that finds some sort of peace in the end. As I started developing the relationship with the mother, I knew there had to be an unexpected resolution. Finally, seeing the father, though we don’t really experience it too much, felt like the right direction. As I writer I typically don’t know where the story will go until I write through it. NICHE: What metaphorical role does the act of drawing play in this story? AMANDA LEWAN: Drawing is the main character’s way of releasing her emotions, of understanding. You sense she doesn’t necessarily enjoy the holidays in the “normal” sense with a family, friends, and parties. Creating a piece of art that she can share is her way of finding some enjoyment during this time. It helps show the distance with her family, and her urge to reconnect with a father-artist too. NICHE: One of the many things you do well in this story is navigate through a large span of time. That is, it covers many years in a life, which is very difficult to do in a short story since, by definition, short stories are meant to be compact. What advice would you give writers who are trying to accomplish the same technique in their own stories? AMANDA LEWAN: For me, I do best when I write out a draft and revisit it months later. I am able to tighten it up and sense the flow of the story. Distance helps me get a better feel for the pace. I also received great advice: go through and mark the scenes in the story. Are there any scenes that aren’t necessary? NICHE: Mel’s anger at her mother seems to escalate throughout the piece, but it is also startling complex and truthful in nature in that Mel herself can’t exactly pinpoint where all her anger is stemming. As a writer, how do you achieve this emotional verisimilitude? AMANDA LEWAN: This is a really difficult question for me to answer. I think Mel is distant from her mom in a different way than her dad – she cannot have a relationship with the man in the hospital. She can with her mother, but she doesn’t relate to her as well. It is in part of her mother’s controlling nature, but there is a sense she does not forgiver her entirely for moving on after her father leaves. I hope the reader gets this through the explanation after her father leaves and through the “new holiday” she is asked to spend with her mother. Mel does not accept the new life her mother created after her father’s hospitalization. 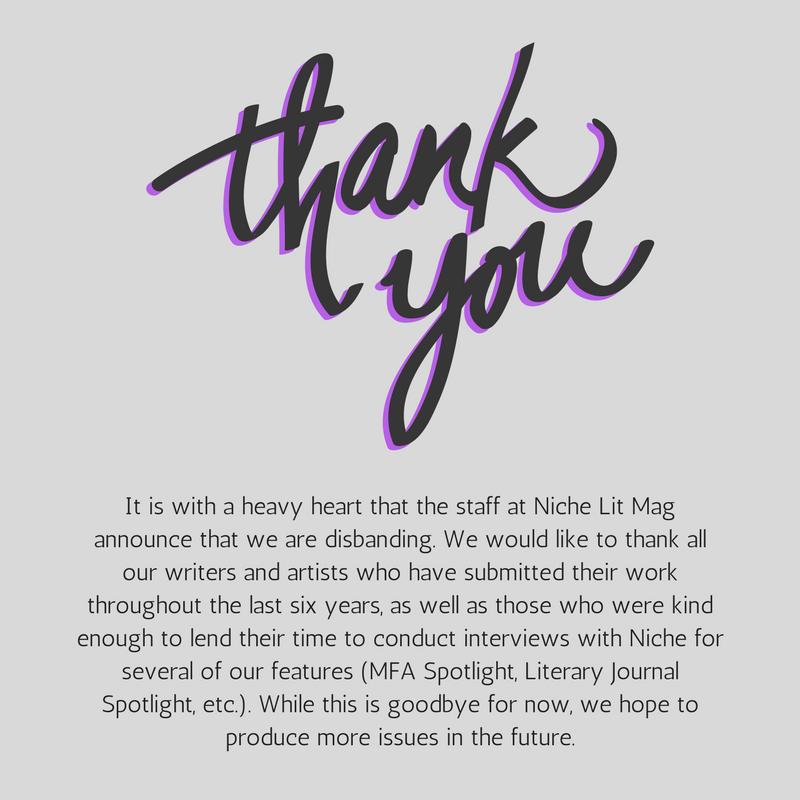 NICHE: What advice would you give aspiring writers, especially those who are looking to submit to literary magazines? AMANDA LEWAN: Keep on writing. Put yourself out there as much as you can. It’s all about finding the right readers, and the right magazines. Read the magazines. Look for writers you identify with and see where their work has found a home. Likely, it may be a good fit for yours. I adore literary magazines and publications, but I also recognize self publishing as an option too. Don’t give up. We’re lucky to have self publishing tools easily at hand if we need them. NICHE: Is there anything else you would like our readers to know? AMANDA LEWAN: If you’d like you can follow me at http://www.amandalewan.com (http://www.amandalewan.com/) where I try to blog frequently. This interview first appeared on Niche’s website on June 3rd, 2014.